Oh my gosh I LOVE this! What a cool idea to do Disney Villains. And yeah, I’ve already had to cut into her hairline in order to get necklaces on her. This has to be my favorite dress so far, but just a small bit of the left side of the veil is missing; when you put it in PDF. Evil wedding dresses! Pure win! You know, I have a book of Grimm’s fairy tales and I’m not sure I knew her name. Which is odd, because I adore original version fairy tales. Maybe I have an abridged version. Or need to read it again. I don’t think the collar should be too hard for me, I tend to have good luck with fitting since I glue the dresses on. 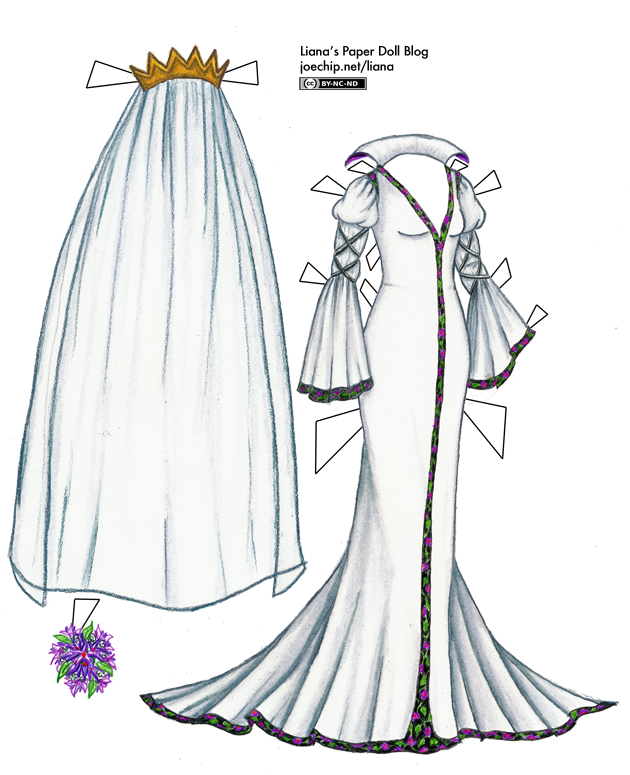 Like for the medieval dress, I just snipped the veil flowers off and glued them on separately. I’ve been printing Grace for every outfit but I think for this I’ll have to print Ivy and color her hair with my new Prismacolors (I love them. Took me a while to get used to them, but I love them!) and try to make her look as much like the evil queen as possible. I do believe this is the longest comment I’ve ever left you. I forgot to ask something and I figured I should do it now because I’ll forget by tomorrow. Do you think you could sometime do an outfit based on the Abhorsen series by Garth Nix? Like Sabriel’s blue surcoat and bell bandolier (probably spelled that wrong) , or Lirael’s red library waistcoat, or the Clayr’s white robes. I would love you forever. It is almost like the queen is trrying to appear sweet and angelic with the white but evil is seeping out into the trim. Nice job! Hah, I’m glad you all like this ^^ This is another one you can thank Brian for. So often I’ll be about half done and not like it, and I’ll show it to him and he’s like “Yeah, it’s great!” and point out the things he likes and make me feel all encouraged again. Lindsey, thanks for the printing report! I will fix it at some point today — probably just put them on two separate sheets, I think. I guess I can assume that the .png version is the same way? Has anyone printed that out? Sami, I’m glad you’re having fun with the Prismacolors ^^ I’ve never read that series, but I’ll put it on reserve at the library. Thank you Brian for encouraging her. I adore this dress and it would of been such a shame for it not to come to fruition. I think i need to make me a villain dress. There’s just so much more style to it! Love the dress, I think I heard of the witch being called that, but i’m pretty sure it wasn’t for the Disney movie. You know, I just noticed that you posted this on my birthday! Oh, you should definately do more villian dresses! My boyfriend would love a Maleficent dress (he fell in love with her as a little boy, because she is a dragon (please note, she does not just turn into a dragon, she IS one), so if she ever comes for him he’s dumping me). For putting on a doll, I recommend cutting straight down through the middle of the collar behind where the neck would be. And maybe do a little tape reenforcement on the right side where it’s thin.